Baxter joins a research project to help find robotic solutions to disaster and emergency relief workers currently dealing with Ebola. Robots have been playing an increasingly important role supporting humans with tasks which contain a high element of danger or risk in the field of disaster and emergency relief. People have utilised robots during the clean up after 9/11, the Fukushima power plant disaster and more recently the Ebola crisis. The potential for robots in the field of disaster and emergency relief is uncharted, not only creating new jobs but protecting those already in employment, and now even the White House is getting involved. The recent Ebola outbreak in West Africa is now uncovering another new purpose for robots and with this comes a problem for robotics researchers to deliver a practical workable solution. 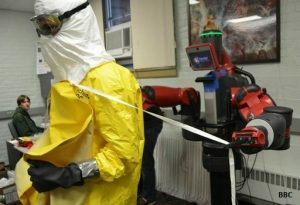 As part of this, the Baxter Research Robot has moved out of the research lab and into the role of lab assistant helping Ebola aid workers with manual handling processes to reduce the risk of contamination. However, the BBC has identified a gap between the potential for robots to fulfil these roles and the education level of robotics students in providing practical solutions for workers. Currently most robotics research is undertaken on a theoretical level with very little solutions testing but now with the development of Baxter this void is being filled with Baxter’s implementation in robotics labs across the world. As part of their research programme Worcester Polytechnic Institute (WPI) in Massachusetts has created a realistic research environment for Baxter researchers enabling them to replicate the working environment of Ebola workers. This provides the perfect backdrop for their researchers to explore the problems faced by aid workers and the feasibility for robots to function in a practical environment for preventing, detecting and responding to current and future outbreaks in a whole variety of fields. It is a topic which has peaked interest across the world and has even made in to the White House where last week 3 leading US robotics Universities broached the subject with US government representatives from the Office of Science and Technology Policy. The problem for researchers, governments and non-governmental organisations (NGOs) now is the gap between theoretical research being undertaken and the practical application with current robotic technology to provide an implementable working solution for outbreaks such as Ebola. The Baxter Research Robot can be used for this research with students and to provide the end user function so researchers can provide a classroom to lab solution using the same robotic platform.